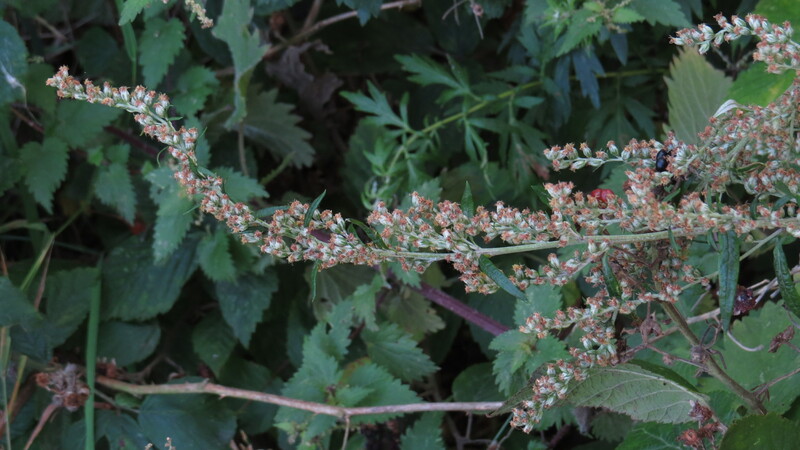 Dear Readers, it is always a pleasure to write about a very common and widespread ‘weed’, especially one that may have slipped under our radar. So it is with Mugwort (Artemisia vulgaris), a member of the Daisy (Asteraceae) family. It has sprays of little, unobtrusive flowers, deeply-cut leaves that look silver underneath, and it is said to be faintly aromatic, though as usual I forgot to check out the scent. Medicinally, it seems to have been mainly used in two ways: to ease period and childbirth pains, and to lessen the shaking of ‘the palsy’. It was thought in Wales that a bunch of the plant tied to the left thigh of a woman in labour would ease her distress, though the plant had to be removed immediately after delivery to prevent haemorrhage. The dried leaves were used to ease ‘hysterical fits’, and were also thought to be a cure for epilepsy. It was probably these medicinal properties that resulted in it being imported into the UK in ancient times (it’s native to mainland Europe, Asia, North Africa and Alaska, and is naturalised throughout North America). One of Mugwort’s alternative names is ‘Poor Man’s Tobacco’, and the dried flowers have been smoked by young people since time immemorial. Smoking the plant is said to cause vivid dreams. As if being an intoxicating drug wasn’t enough, it has also been used to flavour beer (much like ground ivy), and some think that this is where the name ‘mugwort’ originated, beer being drunk from a pottery mug in those days rather than a glass. If you would like to have a bash at creating your own Mugwort beer, there’s a recipe here.And if you get very keen, there’s a recipe for an ancient gruit beer here: gruit beers predate hops, and so are closer to what our medieval ancestors might have glugged down, just before they fell, singing, into a hedge. An alternative reason for the name might be that ‘mug’ is a variant on the old word ‘mouchte’, meaning moth – the leaves have long been thought to be efficacious against clothes moths. In Cornwall, the leaves were used as a tea substitute when ‘real’ tea grew too expensive during World War ii. 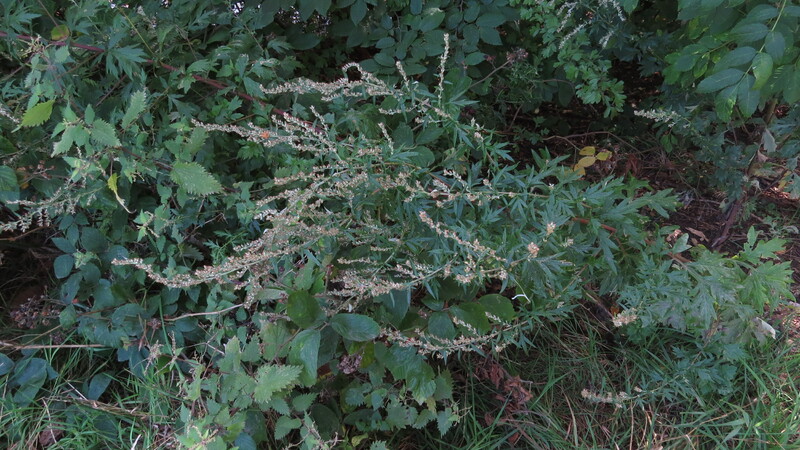 It is also used as a culinary herb for stuffing roast goose on St Martin’s Day in Germany, although as it is closely related to that bitterest of herbs, Wormwood, I suspect it may be an acquired taste. 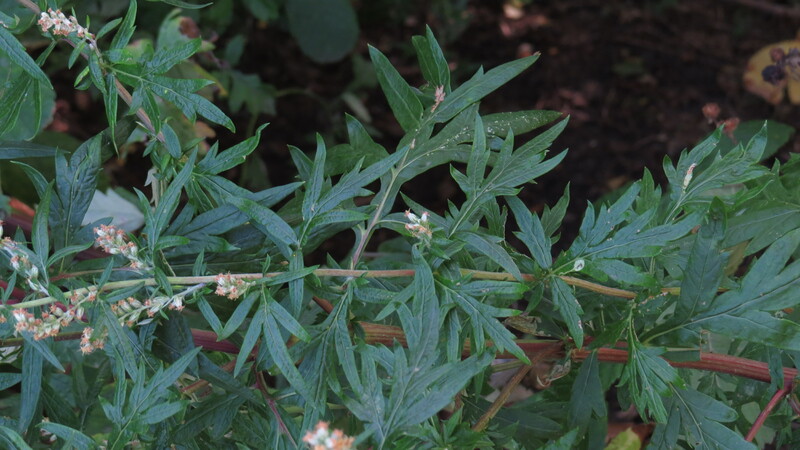 Mugwort is used extensively in Korean and Japanese cuisine, but the plant they use is not ‘our’ mugwort. Some members of the genus Artemisia are much more bitter in flavour than others. Mugwort has a long association with St John the Baptist, and with travellers. The saint was said to have worn a girdle of the plant for protection when he was in the wilderness, and stuffing your shoes with mugwort is said to be a talisman against everything from fatigue to being attacked by wild beasts. In Holland and Germany, the plant was gathered on St John’s Eve (23rd June) as a protection against misfortune in the year to come. I note that this is very close to the Summer Solstice, and may be yet another example of the blending of Christian and Pagan beliefs. You might think that the Latin name for Mugwort, Artemisia vulgaris, links the plant back to Artemis/Diana, the goddess of hunting in Greek and Roman traditions. However, there is some thought that it is actually named after Artemis II of Caria, a botanist, medical researcher and naval strategist who died in 350 BC. She managed to hold off the navy of Rhodes, who advanced on the little island of Caria because they thought that a female ruler would be easy to defeat. She soon showed them their marching (sailing) orders. 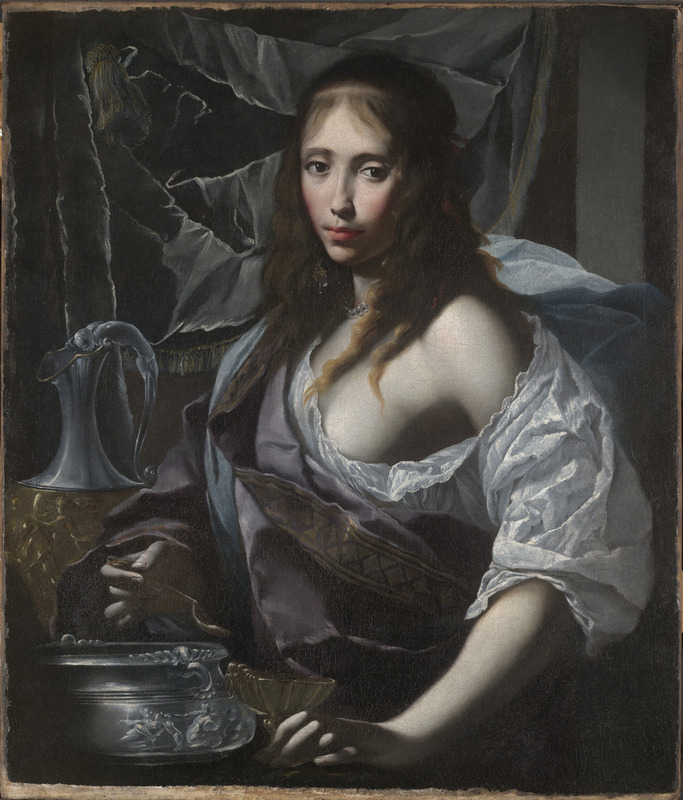 However, she is best known to history as the woman who drank her dead husband’s ashes in a goblet of wine every day as an act of extravagant mourning. The fact that her husband was also her brother adds a salacious frisson to the whole tale. Many artists took to their brushes to depict this scene, rather than her naval victories.. Women are so much less threatening when they’re imbibing their husbands and looking mournful. Especially when their blouse is dropping off. And to end, here is one of the last poems of Edward Thomas. I don’t recall the honeycomb smell of ‘mugwort dull’, but there is something about this work that captures that moment, poised between summer and autumn, between hope and despair, that I feel in my bones. I’ve read it once, and then again. It haunts me. Strange days, indeed. Chiefly that paddled, I was thus beguiled. He took the heat of the sun, and from below. And sun together and to know their worth. That never vanish and for ever travel. I lost. And then the child’s voice raised the dead. A word for, while I gathered sight and sound. This entry was posted in London Plants on September 6, 2017 by Bug Woman. Enjoyed reading very much between the haunting poem and the story of Artemisia, and plants of course! Thank you, very glad you enjoyed the blog. Thanks for identifying another plant I see almost daily and have never thought to look up. And nice to see the Edward Thomas poem. Have you read his daughter’s Myfanwy’s memoir, in which she remembers that day with her father – she was the ‘child’ of the first line. No I haven’t read the memoir, it sounds fascinating! It’s good to know that what always seems a bit of a dull looking plant has such an interesting history! 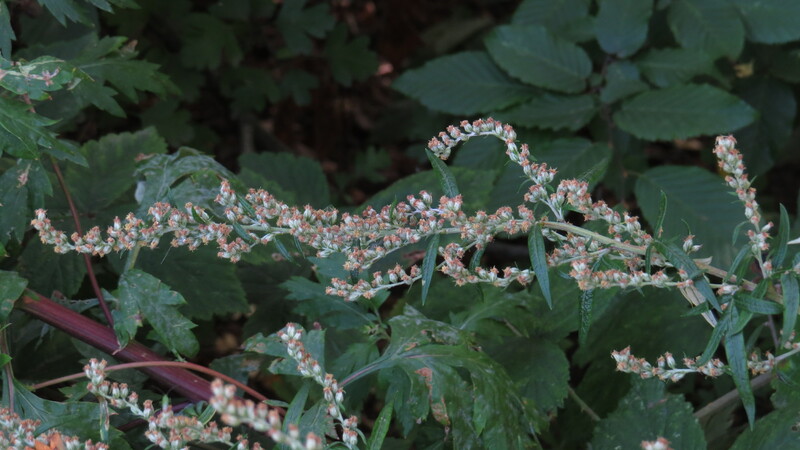 Another plant that I don’t recall ever seeing in my whole life – could that really be? What a haunting poem; and now, Sarah has set me off on a quest to find Myfanwy’s memoir.